Today’s recipe is a popular 1 bowl meal well-loved by all Koreans. It’s delicious, savory soybean sprout soup with rice mixed right in. It’s fast, warm, hearty and satisfying. 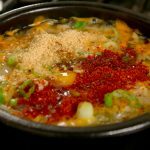 This style of soup is called gukbap in Korean – literally soup (guk 국) and rice (bap 밥), and this recipe with soybean sprouts is called Kongnamul-gukbap (콩나물국밥). The broth of this soup is made with anchovies, kelp and soybean sprouts and is super tasty all by itself. Then, adding Kimchi makes this soup a bit sour and gives it a crispy texture. To make it a little more filling, rice is cooked right in, making the broth a touch sticky and soupy. Last but not least lots of nutty stuff is added at the end, like toasted sesame oil and freshly ground toasted sesame seeds. For me and most Koreans, it’s the perfect dish to warm your body and soul. But it’s also a great diet food, too! You don’t have to worry about eating lots of carbs because there’s only a half cup of rice in the bowl and you’ll feel totally satisfied and full after eating it. In this recipe and video I make kongnamul-gukbap in two 4-cup Korean earthenware bowls, which are great for soups and stews because they keep their heat long after they leave the stove and your soup will stay warm as you eat it. But even if you don’t own Korean earthenware bowls you still can make this recipe. 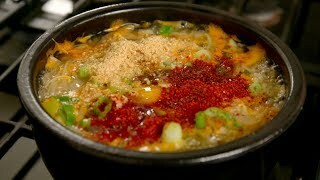 Use a large heavy shallow pot and add all the ingredients for kongnamul-gukbap. Cook until it’s bubbling, then crack the eggs over top and follow the remainder of the directions. When you serve, prepare individual bowls and a ladle. You can ladle some to your bowl. Don’t forget your egg, too! If you like to use chicken, beef, or vegetable stock instead of anchovy and kelp stock, choose unsalted stock and use 7 cups’ worth. Once the stock starts boiling, follow the rest of the recipe below, starting with “add soybean sprouts” (and ignore the parts about kelp). I hope you enjoy this recipe and make it with someone you love. You can both be warm and hearty! Put 8 cups of water in a pot and bring it to a boil. Put anchovies into a soup strainer or soup pouch and add to the boiling water. Add dried kelp and cover and cook over medium high heat for about 10 minutes until it boils vigorously. Turn down the heat to medium and cook another 10 minutes. Add soybean sprouts, garlic, and salt. Press and stir with a ladle or a wooden spoon so that the soy bean sprouts are submerged in the stock. Cover and cook for 5 minutes over medium high heat. Take out the kelp and the anchovy pouch. Strain the stock and soybean sprouts through a large strainer, into a large bowl. You will get about 6 cups stock. Put two 4-cup Korean earthenware bowls, on the counter. Divide the sliced onion and put a portion into the bottom of each bowl. Add ½ cup cooked rice to each bowl. Divide the chopped kimchi and put a portion on top of the rice in each bowl. Divide soybean sprouts and put a portion into each bowl. Put some chopped green onion on top of the soybean sprouts, keeping back 2 tablespoons to use later. Grind¼ teaspoon of ground black pepper over each bowl. Add 2 cups of stock to each bowl. Put the bowls on the stove and cook over medium high heat until they are bubbling. It will take longer for an earthenware bowl to heat up, about 12 to 15 minutes compared to a regular pan or pot at 7 to 8 minutes. As the soups are boiling, crack an egg for each and put into the center of each bowl. Cook for 1 to 2 minutes. Spoon ground sesame seeds, hot pepper flakes (if used), and the rest of the chopped green onion on top of each bowl. Drizzle sesame oil over each bowl. Serve bubbling hot directly from the stove. You don’t need many side dishes when you serve kongnamul-gukbap but some vegetable side dishes would go well with it: spinach side dish (Sigeumchi-namul: 시금치나물), bok choy doenjang-muchim (Cheonggyeongchae doenjang-muchim 청경채 된장무침). Koreans usually serve this soup with some salted fermented shrimp (saeujeot 새우젓) on the side in a small bowl. Taste the soup first. We already added salt but if it’s not salty enough, add a tiny amount, a quarter teaspoon of salted fermented shrimp, and mix it in. Add more as needed. You could also use salt instead of salted fermented shrimp. Posted on Saturday, November 18th, 2017 at 12:01 pm. Last updated on November 19, 2017. Posted February 1st, 2018 at 6:45 pm | Log in to reply. Making this for my Korean husband tonight. In our house, kongnamul guk became one of his regular meals, but this sounds much more exciting! Unfortunately, we now have an electric stove instead of a gas burner. Will the earthen bowls still work okay? Posted February 9th, 2019 at 2:31 pm | Log in to reply. I use my earthen bowl on my electric stove & have no problems with it. Posted January 10th, 2018 at 6:13 pm | Log in to reply. I have been so busy with my university exams, but tomorrow I am going to take some time and relax by making this wonderful recipe! Posted December 15th, 2017 at 2:17 am | Log in to reply. I hope it is as delicious as it looks here. Posted November 25th, 2017 at 8:44 pm | Log in to reply. Posted November 27th, 2017 at 8:31 am | Log in to reply. You made this for your wife, awesome! Posted November 18th, 2017 at 5:52 pm | Log in to reply. 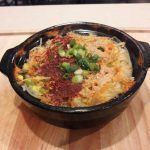 This recipe was originally posted on November 18, 2017 at 12:01 pm by Maangchi. It was last updated on November 19, 2017. The video was watched 574,374 times on YouTube & has 14,319 likes!